I couldn’t help but smile back to the comment. Yes, yes I just go do it. Sometimes it is better to try a little bit of something and see what happens than stand in analysis paralysis thinking deeply about what could be changed. Though I absolutely value the therapeutic process for design thinking and systems thinking and other efforts, I joke often with folks that I am built for “design doing” – I love the exploration of theory and the act of research, and then I’m ready to dive in and see what happens if we try something new. For the last year, Flip the Clinic has been working directly with a single practice site and testing the flips, ideas, and elements behind our work from the last three years in partnership with the brave team at the Children’s Integrated Center for Success. I’ve been working intensively with the practice lead, Amy Edgar, on everything from the basics of marketing to the intricate choices of team design and care delivery models all while serving as an executive coach on our journey together with Flip the Clinic to test what works and doesn’t across the Flip the Clinic work. At times, we’ve had to jump to doing. It isn’t always comfortable but, to me, it symbolizes the action necessary to actually take a leap to something new. Throughout this process we’ve been writing. Writing and interviewing and capturing the adventure. 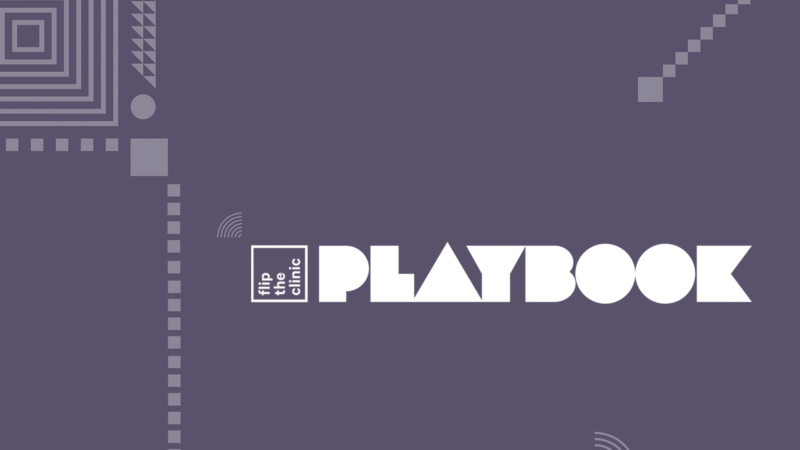 The Flip the Clinic Playbook, a 200+ page book offering our tips, tricks and how-tos for the path to flipping your clinic – as a clinic, clinician, patient, caregiver, community, or other interest group is flooded with illustrations and tools to take you from thinking about something to doing and it is officially — HERE! Get your copy of the Flip the Clinic Playbook!